An Automotive Stamper was using Hot Dipped Galvanized CR780T/420Y 60G60G Steel from a local supplier, and noticed that the metal was resistant to the stamping process. This restricted the Stamper from creating the complex shapes required by their customers. 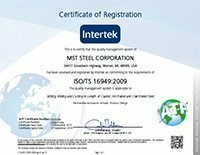 The stamper was also using MST Steel as a supplier for other types of steel, knew we have worked with many domestic and overseas business concerning Hot Dipped Galvanized Steel. They asked us to perform a part evaluation of our Hot Dipped Galvanized Steels and recommend the best steel for their stamping process. After performing our evaluation we suggested a high-forming version of the Hot Dipped Galvanized Steel with optimal elongation range, along with tensile and yield strength. The customer changed to the steel we recommended, and as a result, has had no issues with stamping the steel for their products.